A Neighborhood of Infinity: Why is nuclear fusion so hard? Why does water fall out of an inverted cup? Before considering nuclear fusion, let's consider something much more familiar. If you turn a cup full of water upside down, the water falls out. Why is this? 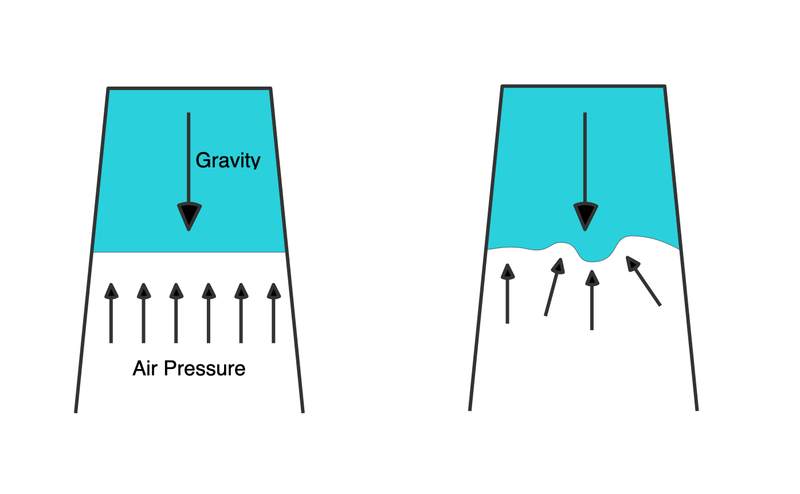 It seems obvious: with nothing supporting the water from below, gravity pulls the water out of the cup. But let's look a little closely at the left side of Figure 1. We have water in an inverted cup under the influence of gravity. But there is air pressure at the surface of the water. At sea level, atmospheric pressure is about the weight of 1kg per cm2, easily enough to keep the water in the cup. So now we still have our question: why does it come out? Consider the diagram on the right of Figure 1. I have drawn some ripples on the surface of the water. Air pressure provides a force perpendicular to the water surface which means that around the ripples we no longer have a force pointing straight up. The force points partly sideways and this serves to deform the shape of the water surface. But as the water surface becomes even more deformed the forces become even more distorted away from vertical causing a feedback loop. So we can expect even the tiniest of ripples to grow to the point where the water completely changes shape and it eventually deforms its way out of the glass. And that's one of the biggest challenges facing fusion energy today: we don't know how to keep a plasma stable for long enough. Is there any hope for fusion? The description above is qualitative. To determine how severe any particular instability is we need to run experiments or use some theory. Some kinds of instability are slow enough that we can control them. For example bicycles are unstable, but many of us eventually learn to ride them. In a thermonuclear weapon stability is only required for a short amount of time, something that was achievable back in the 50s. And sometimes the feedback loops in the physics are less troublesome than might be expected so that Tokamaks (and other configurations) have operating modes that turn out to be relatively stable, for example the "H-mode". So maybe we'll have working fusion reactors in 20 years, or 30 years, or is it 50?